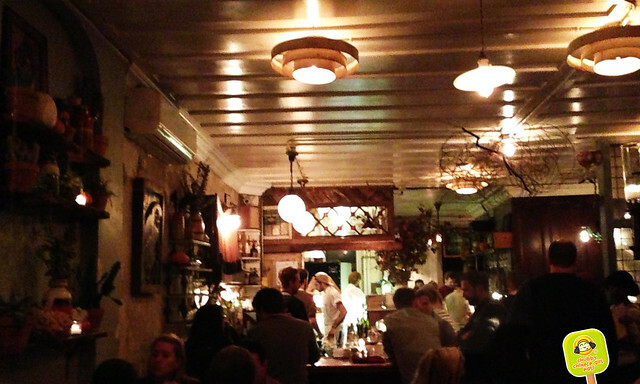 Vinegar Hill House: Twice in a week. Amazing Dinner and another amazing Brunch. The appetizers we shared were great. 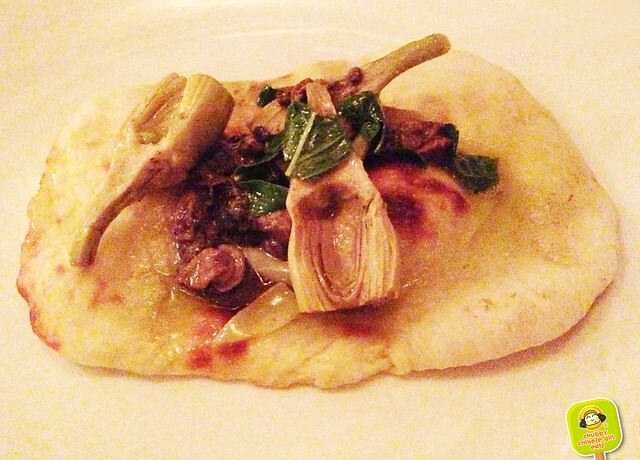 The juices of the escargot, artichoke hearts and basil flavored the flat bread beautifully. It had a chewy texture. Though the escargot was a bit too soft for me, I’m guessing that’s from a can. 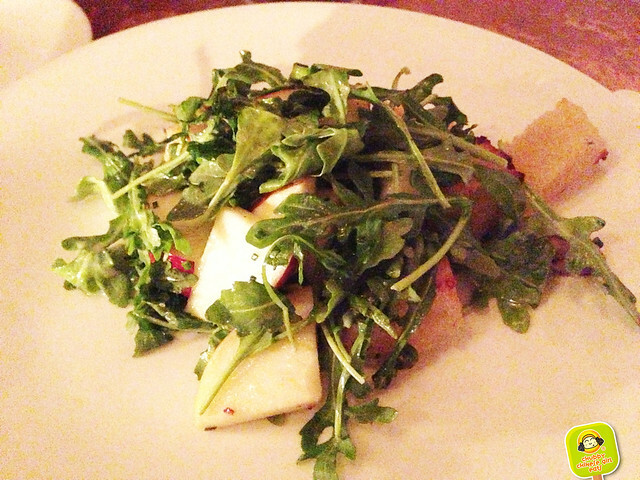 The sweetness of the crisp apple went well with the peppery arugula. Lightly dressed, the citrus was bright and the taleggio croutons were crunchy. Was fantastic. Very intense “liver” aromas, rich and creamy. 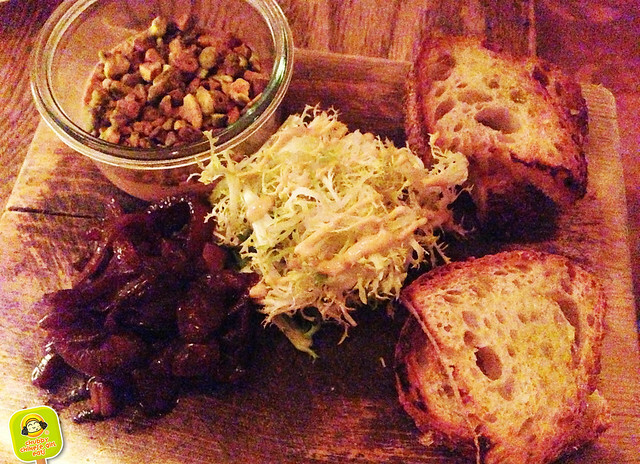 The toasted pistachios added crunch. The vinegar onions cut the richness. A great bite on the buttery toasted bread. Our favorite of the night, hands down. The entrees were a bit more dissapointing. I brought a friend from out of town, promising the best cast iron chicken and pork chop so imagine my surprise when everything was different! and not in a good way. First of all, it’s served on a plate instead of the board, which sorta loses that unique presentation. They’ve been serving it with a bed of cheddar grits instead of their homemade sauerkraut for a while now, I like them both, so I’m ok about that. But the portion is so small! Like 30% less (see photo and review below). Sure it still eats like a steak and flavors were as I remembered, but overall, it just didn’t sit well with me. Overall it was still a decent meal. We all enjoyed it. But for those of us familiar with what it use to be… if just doesn’t feel the same anymore. It is no longer a 5 Chubby kinda place… which is very sad… It almost feels like a bad break-up. I use to love this place! Now we are merely acquaintances. One of my all time favorite things to do on a bright sunny NY afternoon is to walk the Brooklyn Bridge. It brings this warmth comfort to my heart, the beauty of the skyline, the shimmering water and the blue sky. An affirmation of how much “I LOVE NY”. Of course food is always involved. No, not Grimaldi’s (I hold firm that the home of the first pizza aka Lombardi’s is better anyways) or the beautiful River Cafe, it’s million dollar views and more affordable Sunday Brunches, nope, those aren’t what I’m referring to. 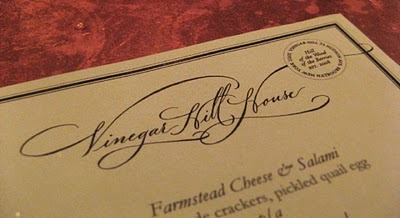 I’m talking about walking a little further off the path and entering Vinegar Hill House. Rarely do I repeat a restaurant within a month, but here, I showed up twice in one week, trekking from as far as Queens. Yeap, that good. I suggest you get your Metrocard ready now! It was after 10PM, a couple drinks in our system, courtesy of Galapagos Art Space, on a quiet Monday night. 3 chicks in heels, lost on the lonely streets of Dumbo/Vinegar Hill. Not one soul insight, I promised them an enchantingly delicious meal of wood oven chicken and many more palate pleasers, they trusted and we persevered. The Manhattan Bridge started to get out of our sight and the street got darker than dark, just as we were giving up, a turn on Hudson Street revealed the only light in the middle of the street. There it stood, a tiny, rustic and cozy joint. Full house and a 25 minute wait, a polar opposite of anything outside these doors. We were amazed, it was confirmation that our tummies would be in for a treat. As we patiently waited by the bar, we continued our drinking of course. Not sure what this was, I can’t seem to recall… and I didn’t write it down, how unlike my blogger self. I apologize, just know that it was sweet, bitter and strong. Appetizer started off with Oven Roasted Octopus. 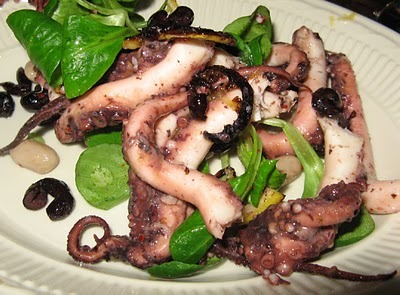 Meaty bites of octopus are kissed by fire with pieces of romanesco, parsnips, pleasantly bitter black olives, and charred Meyer lemon that brought a hint of tartness. Everything working closely, complimenting each other in flavor and texture. I love octopus and this reminded me why. 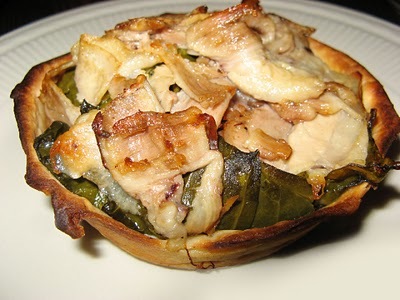 Pork Belly and Collard Greens Wood Fired Tart. Comfort in a little package. Crusty buttery layers holding soft leafy greens and sinful pieces of tender, moist pork belly, one things for sure, this level of yumminess can only come from spending some good old quality time in the oven. Where can I get me a dozen of this smokey goodness?! 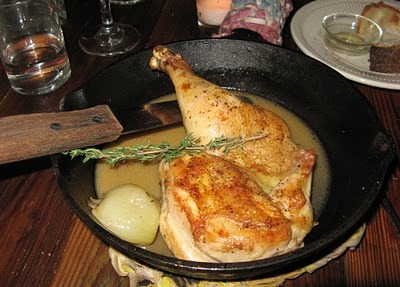 The simply named Cast Iron Chicken is anything but simple in taste. 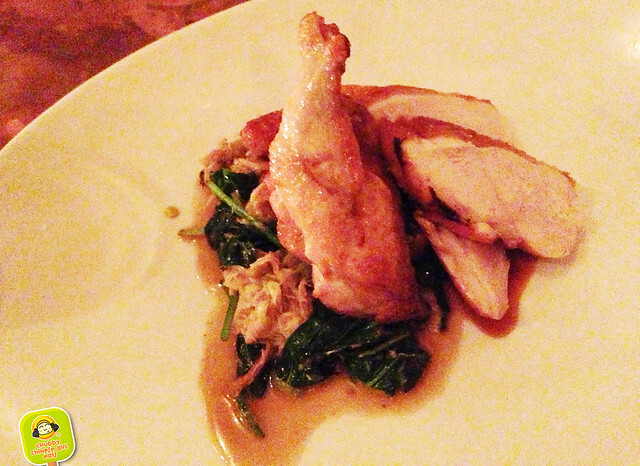 Super moist, right out of their wood oven, I’ve never had oven roasted chicken like this. Juicy and oh so tender. The buttery sauce, a hint of lemon, onions and herbs. Comforting, bright and ohhhhhhhhhhhhhhhhhhhhhhhhhhhhhhh soooooo gooooood. Everyone around the table repeated over and over. There no better way to describe it. All other oven roasted chicken beware, this is it. Just when I thought the chicken was the most outstanding thing on their menu, out comes the Red Wattle Country Chop. I didn’t know pork chop could be elevated to this level. 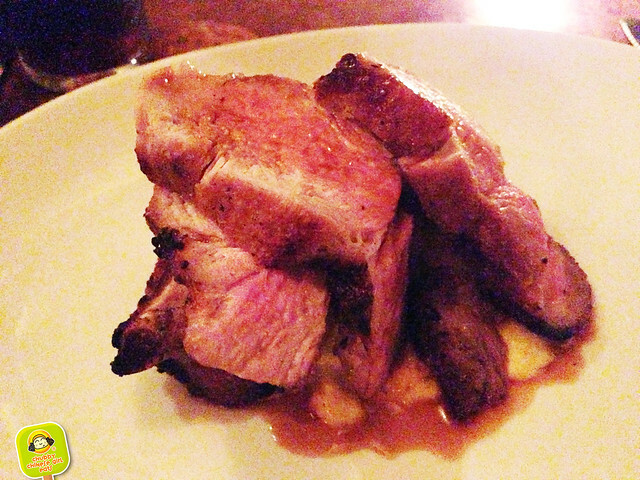 Some call it a steakhouse experience, while eating pork. 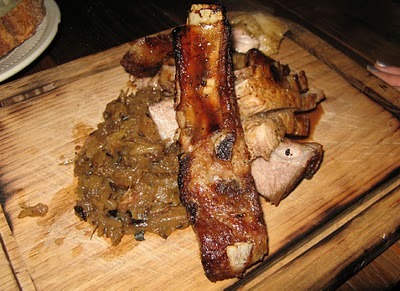 One bite into this juicy, tender, chard, meaty goodness and forget all that hype about pork belly, there’s a new porkaliciousness in town. Simply seasoned, cooked to perfection. The homemade sauerkraut is a little tart and extra flavorful, helping cut any fat left and kicking it up another notch in the flavor texture department. I might of enjoyed this even more than the chicken, I didn’t know that could be possible, but it happened. Oh joy. Oh joy. Oh joy. House brewed French Coffee… check. 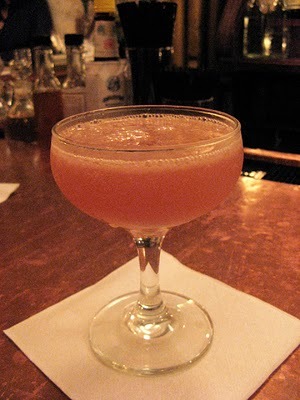 Fresh Grapefruit juice… check. 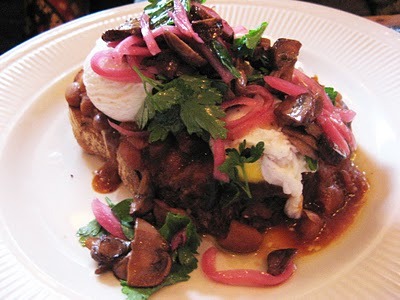 Started off with the Beans on Toast topped with two delicately poached eggs, mushrooms and shallots. Good but not worthy of further elaborating. If you must, order it, but I say skip it. Now to our main event, we were able to get down a full order each, after sharing the Beans on Toast. Yeah, that amazing. 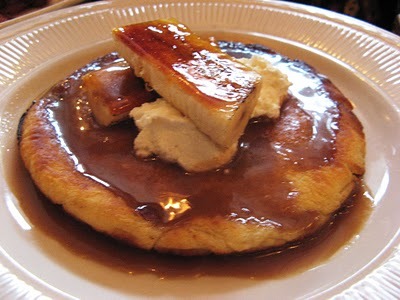 Angela’s Sourdough Pancake, best pancake this Chubby ever laid eyes or fork on. Tremendously fluffy and light, with fresh creamy ricotta. Melt in your mouth center, a little chard and crispy outside. Topped with Brulee Bananas! how wild and fabulous is that? The sugar is burnt until golden brown and solid. I’m not a morning person, but will gladly wake up for this any day. 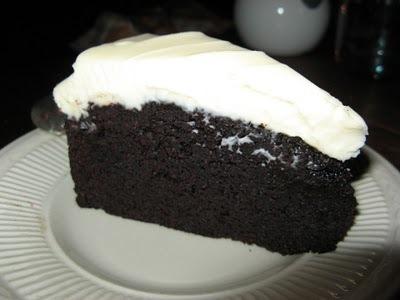 The combination is perfect, right textures, not too sweet and dense. Love, love love!!! I don’t know who Angela is, but I would give her a wet kiss if I saw her. And don’t forget to add Maple Glazed Bacon on the side. I don’t know if I can have friends who don’t absolutely love bacon, yeah, I can’t. 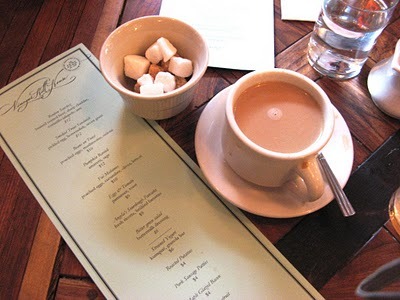 Vinegar Hill House is only a train ride or brisk Brooklyn Bridge Stroll away. The long weekend is coming up and a meal there definitely constitutes as an “activity” on the calendar (everything revolves around food). Either brunch, dinner or just go wild and do both on the same day, you won’t be disappointed and the view of downtown Manhattan a few blocks away will surely delight your sight. I'm putting this one on the list of places to visit!!! Love the description of meaty octopus kissed by fire!